The book’s plot revolves around a Black Court vampire blackmailing Harry into searching for something called the Word of Kemmler. Harry not only has to find it, but first he has to figure out what it is. This book introduces the third of the three major antagonist organizations Dresden will continuously face. A group he calls “The Black Council”, because it consists of wizards who use black magic. Harry suspects some may be renegade wizards from his own Council, but he has been unable to find proof. This is the only book in which Karrin Murphy does not play a major role. She meets with Harry briefly and calls him once. The scene she is in is important as it begins to clarify Harry and Murphy’s relationship. Throughout the series there has been a “will they get together, won’t they get together” feel to their relationship. While this will continue in other books, the end is in sight. Like all Dresden Files books, this one is great mixture of action and relationships. With Murphy gone, Harry spends most of this book with his recently discovered brother, who is living with him. Their relationship evolves throughout the book and they make up for having spent most of their lives apart. Butters’, who is a minor character in some other books, plays a major role in this one. Thanks to Harry’s influence, he will make decisions that will change his outlook on life. I found this sequence interesting because it foreshadows a potentially more important influence Harry will exert in a latter book. 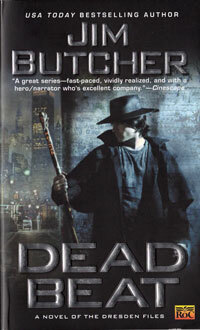 Out of all the Dresden Files books, Dead Beat is my favorite. While the book is similar to the others the addition of a minor character, Carlos Ramirez, and the end action sequence take this particular book above the others. I am trying to avoid major spoilers, but I just have to say two words. Zombie. Tyrannosaurs. I would love to see this book made into a movie. Actually I’d like to see all of them made into movies, but this one, this ending, would be the greatest movie ever made.